Known as "Île-de-France" because it is surrounded by rivers, this is the most densely populated region in France. It also happens to be the wealthiest in the country. The climate is characterised by warm summers and cool winters - very similar to that of the UK. It is a charming area, with pretty villages in the Chevreuse, Yvette and Essonne valleys, and inviting forests at Rambouillet, Saint-Germain and Fontainebleu. It's also an inspirational region where you walk in the footsteps of famous artists who were charmed by its light and atmostphere, from Barbizon, favoured by landscape painters, to Nogent-sur-Marne or Auvers-sur-Oise, home of the Impressionists. Île-de-France is also a land of heritage with a long list of fascinating cultural sites, including Versailles, Vaux-le-Vicomte and the Saint-Denis Basilica. As the capital of France and one of the most cosmopolitan cities you'll come across, Paris has plenty to offer anyone hoping to move there, including an array of chic restaurants and designer shops. However, these luxuries come at a price - property here is by no means cheap! The cost of living is relatively expensive, and in a Parisian supermarket you should expect to pay 5-10% more than anywhere else in France. Communication links from Île de France to other areas are good, clean and reliable. Train services are efficient and cheap. Eurostar makes life easier for the British wishing to visit Paris, whilst the TGV is an excellent way to travel within France. Île-de-France is also home to 2 major international airports: Charles de Gaulle and Orly. Within Paris, the metro is another cheap and efficient way to travel, with stops near all major landmarks. Properties in the centre of the Île-de-France are very expensive. It is not until you get out into the Parisian suburbs that prices begin to fall and become more reasonable. This really is a case of weighing up convenience against affordability. Do you know Île-de-France better than we do? Do you have photos of Île-de-France? The Seine-et-Marne is the largest of the Ile-de-France's departments and contains vast swathes of protected countryside and marvellous stately chateaux. This department offers something for everyone. The Yvelines to the west of Paris has long been a popular choice amongst visiting world leaders. The Presidential retreat at Rambouillet still entertains foreign guests. The rest of the state residences, however, including St-Germain and Versailles have now been opened to the public and mostly function as museums. The affluent neighbourhoods found in the department are becoming increasingly affordable and a popular choice amongst those commuting daily to Paris. The Essonne department makes a peaceful retreat from Paris with the luxury of having the capital's many attractions just minutes away. The area is very much a mixture of the old and the new but prices are high throughout the department as Paris is so close and accessible. The Hauts-de-Seine is part of the Ile-de-France région. It encompasses a large part of Paris itself but remains small and densely populated. The department houses the modern office, theatre, and shopping complex known as La Défense with its modern Grande Arche. Property here is generally luxurious and comes at a price. The Seine-Saint-Denis is a highly industrial department which has suffered from high unemployment in recent years. The department is famously home to the Stade de France and the Basilique de Saint-Denis. High quality residential properties are quite few and far between in the department but industrial property is easy to find. Due to the department's proximity to Paris, prices are above the national average despite the industrial downturn of recent years. The Val-de-Marne has a reputation for being the suburb favoured by the capital's bourgeois commuters. Whilst the department does have excellent transport links into the capital and is home to the relatively affluent middle classes, the Val-de-Marne also has an industrial zone and agricultural areas. Property is, nevertheless expensive, particularly around the lively and chic towns in the north-east of the department such as Vincennes and Saint-Mandé. The Parisian lifestyle has something for everyone and there's a huge range of things to see and do in easy reach of Val-d'Oise. However, this variety comes at a price - house prices in the Val-d'Oise are high. Aubervilliers is a commune or town that is located just to the north-east of Paris, in the department of Seine St Denis, one of France's smallest departments. Aubervilliers has been known as an undesirable area in the past but it is currently the scene of considerable urban regeneration, making it an exciting prospect for property purchase. 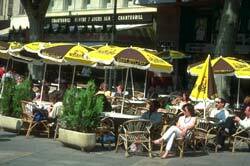 Cergy Pontoise is located close to Paris, in the north of central France. Benefiting greatly from its proximity to the country's wonderful capital city, Cergy Pontoise offers a great city environment with superb facilities alongside history, culture and beautiful lakes and countryside. Maisons Laffitte is a very chic suburb of Paris, beautifully located (partly on an island) along the River Seine, in the north of central France. Lying just over eighteen kilometres from the centre of the capital of France, Maisons Laffitte is a very interesting proposition for anyone wishing to have easy access to this great city and to enjoy the stylish elegance of Paris without the noise and hassle of city centre living. The 18th arrondissement of Paris has a considerable appeal for foreign property buyers as this area contains the some of the famous city's loveliest and best known sights. There is Montmartre, with its Bohemian café society, the Moulin Rouge and the fabulous Sacré Coeur Basilica. The city of Versailles hardly needs any introduction, so renowned is it throughout the world. Most famous for its fabulous Palace of the Sun King, the city lies some ten miles south-west of Paris, and is the capital city of the Yvelines department. Île-de-France is in the centre of northern France. At its centre is the capital city, Paris. WHICH DEPARTMENTS ARE IN Île-de-France?